I’ll never forget the day I met her. 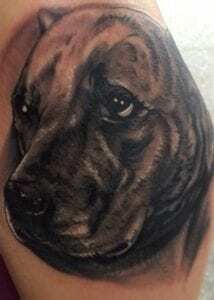 There she was, sitting straight up in the front of her kennel, quiet as can be, stoic.. she looked so beautiful, but all Pit Bull.. cropped ears, brindle in color, and I could see every muscle in her body. She stared at me, head slightly crooked, her ears peaked when she saw the leash in my hand. I opened her pen, attached the leash to her collar and away we went. Life would never the same, for either one of us. Baby on the first day we brought her home, with her “scarf”. 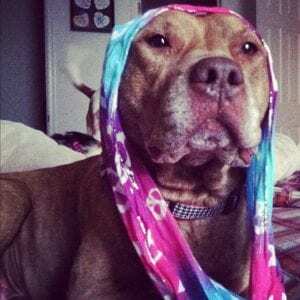 Now this never would have been an issue for me except I was living in an apartment complex at the time that had a strict policy regarding bully breeds, pit bulls in particular. I couldn’t turn her down, she needed me. I decided I would figure it out later.. I could just wrap her head in a scarf when we went out to hide her ears and say she was a Lab mix. I emailed the community manager and explained my issue. She knew that I fostered and gave me the okay to bring her in, knowing she was just a foster and would be finding a new home in no time. 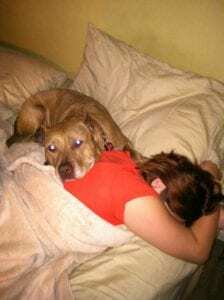 I hadn’t had much experience with pit bulls prior.. I had never fostered one, and didn’t know anyone that had one. Of course I had heard the stories about them. I had no idea where she came from, what her story was, if she even liked men or other dogs. I should have been worried, but something inside me just said to go with it. I brought her home and introduced her to my other two dogs, Jack (Cavalier King Charles) and Chloe (Brussels Griffon/Pug mix). She didn’t seem to take much interest in them, and they didn’t seem to mind her either. She followed me around for the evening until my husband came home and I could tell he fell in love with her right away as well. She was calm, and had a knowledge in her eyes that we had never seen before. We went to bed that night and let her stay in bed with us. When I woke in the morning, there she was.. her body pushed up against me and she was leaning right over in my face, just staring at me. For a split second I thought “this is what it looks like right before she mauls my face.” Instead, she attacked my face with kisses. Everyone always says how hard it must be to foster. To love an animal so hard, to have them light up your life, then let them go. It’s never easy, but there is always a voice inside me that says I need to let them go so I can save another. Before Baby, I had fostered eight dogs prior.. I could have kept them all, but just knew it wasn’t what I signed up to do. As each day wore on, I fell more in love with Baby, but knew the day would come when I had to say goodbye. After a few weeks I received a message from the foster coordinator that someone was interested in Baby. The woman was looking for a companion for her other dog, a male mixed breed. We scheduled the meet for the following day, and I cried the entire way there, knowing what was to come. I put on my brave face, and we walked inside. She pranced in and stole everyone’s attention in the waiting room.. she just had a presence. When we went into the meet and greet room she stayed next to me like glue. The woman tried hard to get her to be interested in her dog, and her herself, but Baby wanted no part of either of them. Inside, I was pleased. I nodded and left. I hugged her so hard in the car and we went home. Baby taking a snooze in her bed. We officially adopted Baby in February of 2012. She was the perfect addition to our family.. she was sassy, and sweet.. she liked to give kisses with her teeth, and she was the best snuggler. She filled a void in me that I never realized was empty. All she wanted was me, and all I wanted was her. She would cry when I left the house, and howl for me. I hated being without her. When I came home, I greeted her first. My kids joked how I loved her more than them. I can’t describe the bond we had, but I just know it’s not something I will ever find again. She showed me what love was. She let me love her unconditionally and let go of her past life. The next three years were filled with love between the two of us. I took her to the lake for the first time and she ran right into the water and wouldn’t come out. We would take trips to the pet store and I would laugh at how her tail would knock everything off the bottom shelf. We would lay in bed together and I would hold her head in my hands and tell her how she saved me. She wasn’t perfect.. but neither was I. I would look her in the eyes and make her to promise to never leave me. I’m not sure when I started to notice changes.. but they came gradually. She seemed to have less energy, and would lay by herself more often. I chalked it up to her getting older. Suddenly, she developed chronic diarrhea and after frequent vet visits and food changes it wasn’t going away. Her stomach started to bloat and she didn’t seem to want to eat as much. I took her to another vet for a second opinion, unhappy with my current vet who refused to give me any answers or schedule any bloodwork. The moment I brought her to Dr. Nigrini, I knew I made the right decision. She was gentle with her and gave her lots of kisses during her exam. She went over every inch of her body and when feeling her stomach area told me right away she wanted bloodwork and an ultrasound done right away. I wasn’t really thinking too much about it, just figured she wanted it done for precaution. We scheduled the ultrasound for the next day. The single worst moment of my life. I’m driving on I-176 when I get the call from the ultrasound technician. I can tell you every cliche there is to say.. but the truth is, my heart stopped at that moment. I felt my world collapse, my eyes filled with tears, and I couldn’t breathe. I think I asked the ultrasound technician some questions, but the answers were all the same. There was nothing they could do, it was too late. Too late for surgery, too late for chemo, too late to turn back time. Dr. Nigrini got on the phone and told me to love her, to do all the things I wanted to do with her that she loved doing. To keep her as pain free, as happy, and as loved as possible. To spend our last moments enjoying every second together. I’m not sure how I got to the vet, or how I got home with her in the car. I just know that I’ve never cried so many tears. How was I supposed to face this? Life without her? How am I supposed to let her die? The next few days were filled with as many kisses as possible.. she stopped eating her prescription dog food, and under Dr. Nigrini’s orders, I fed her whatever she would eat.. she had pizza, pasta, hot dogs, burgers, steak.. all prepared just for her. I laid with her and tried to be strong, tried not to cry. It was a hard weekend for my family, as we watched her body and spirit deteriorate right before our eyes. I held her so close, just wanting to never forget the feeling of her head in my hands as I looked in her eyes and told her how much I loved her. It’s the hardest thing to watch someone you love die and there is nothing you can do. Memorial Day 2015, we decided to let her go. We were proud she fought against her diagnosis and made it to Monday. Everyone told me I would know when it was time.. and on that day, I knew. She lost the spirit in her eyes, they looked empty and black. She would stare at me so hard, as though she wanted me to know it was okay to let her go.. the pain seemed more intolerable and I was told that there was a possibility that her organs could burst if I waited too long. I couldn’t have her go through that. I hugged her so hard and told her it wasn’t forever. We would see eachother again. I thanked her for being my best friend, the love of my life, for showing me what unconditional love was. I held her until she passed, watching as they gave her the serum to end her suffering and as she took her last breath and crossed the rainbow bridge. It took me three days to write this, through tears. One year later and I still can’t even think of her face without breaking down. If you ever get to experience the love of a dog like Baby, then you have experienced life. I got this tattoo of Baby one year and 7 months before she passed. Please don’t ignore changes in your dogs health and behavior. Please don’t accept mediocre vet care. Please demand answers when you know something is wrong. Get a second opinion, a third if needed. Research the best options. Don’t let Cancer win. A lot of people will tell you that cats are clean animals and this is true when you are talking about their physical hygiene. They take great care to groom and keep themselves clean. But when it comes to eating and using the litter box, I find their habits can be a little more messy. But being a cat, their favorite thing to do is eat. A client of mine recently got treated to some homemade cat treats and boy were they pleased! 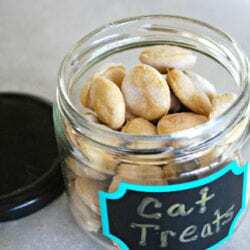 Using a few ingredients that you probably already have at home, you can make the same treats for your feline friend. Click here to get the full recipe. Make sure your dog gets plenty of exercise and is not overweight. Much like humans, an overweight elderly dog will not cope as well with conditions common in older pets such as arthritis. 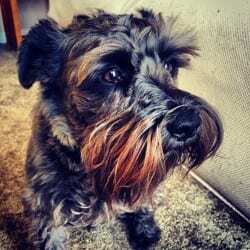 Provide proper nutrition for the elderly dog. Older dogs do not need the same amount of calories as a younger dog. 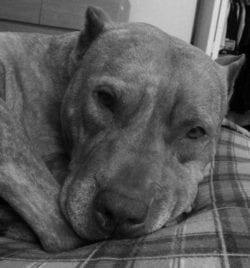 The older dog slows down a bit and, therefore, should consume fewer calories per day. Depending upon the specific issues facing your elderly dog, you may need to add some supplements to your dog’s meals. Supplements such as glucosamine can be very helpful for elderly dogs with sore joints. Be aware of changes in your dog’s behavior. These may include variations in food and water intake and elimination, as well as emotional changes such as lethargy. You are the expert on your pet and know best how (s)he behaves when (s)he is feeling good. Make note of subtle events as such as walking into a room and realizing Spanky doesn’t seem to hear you as well as she did; this could be the start of hearing loss. This is common for dogs, as is some diminished sight capacity. Your challenge as the dog owner is to figure out how to best accommodate your dog’s reduced sensory capabilities. 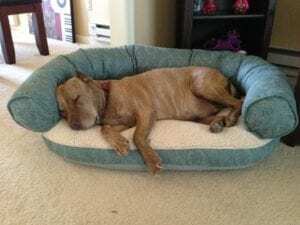 Do you need to change your environment to make sure your dog is safe? For the sight impaired dog, a baby gate over a stairway would prevent an accident. For the hearing impaired dog, many simple commands such as “sit,” “stay,” and “stop” have sign language equivalents which will be helpful for them to learn. Note that old dogs can and should learn new tricks! Keeping your elderly dog engaged mentally stimulates them and provides another outlet for their spirit as their physical abilities decline. As a dog owner, you are most familiar with your dog’s strengths. You are able to create games and tricks which help them use their strengths and challenge them in areas where they are not as strong. For ideas, the internet is a vast resource! Veterinarians now recommend that elderly dogs receive checkups every six months. Keep rigorously to this schedule and you will be better able to handle any health issues which may arise. If you do suspect something is wrong with your pet, do not delay in acting. No matter what the health issue, the earlier your pet is seen by the vet, the better chance of proper diagnosis and treatment. Be resourceful. Be aware of not only traditional veterinary solutions for your pet, but also investigate possible holistic alternatives such as acupuncture and herbal medicine. Do make sure any professional practicing these techniques has been appropriately licensed and accredited. If you choose to combine traditional veterinary solutions and holistic solutions for treatment of your pet, make sure each veterinarian with whom you are working understands what the other is doing. Traditional medicine and holistic medicine treatments may not always complement each other. Full disclosure with each vet is very important. Make sure your pet as comfortable as possible. As the aging pet has become a new demographic among pet supply stores, there are more products available to help owners keep their pets comfortable. Items range from ramps for those dogs not able to use stairs to special orthopedic beds for dogs with arthritis.